The house puts a limit on how long residents can live here. At the outset, you’re admitted for two years. Staying longer requires an application making the case that you’ve been a reasonably reliable contributor to house life and that you’ll continue in that vein in the year ahead. A similar process is available for a fourth year, but that’s the limit. In the two years we’ve been here, the house has welcomed 16 new residents. Four of them have left for one reason or another. Of our 19 current housemates, we’ve been here longer than 12. As much as we’ve occasionally wished for a longer tenure, I think the residency limits make sense. Living in this sort of community can be a transformative experience, especially if it’s carried forward into something new. And there’s something about getting to know a new resident every six or seven weeks that makes life at BHFH even more interesting. We’ve considered a number of options for life after BHFH. 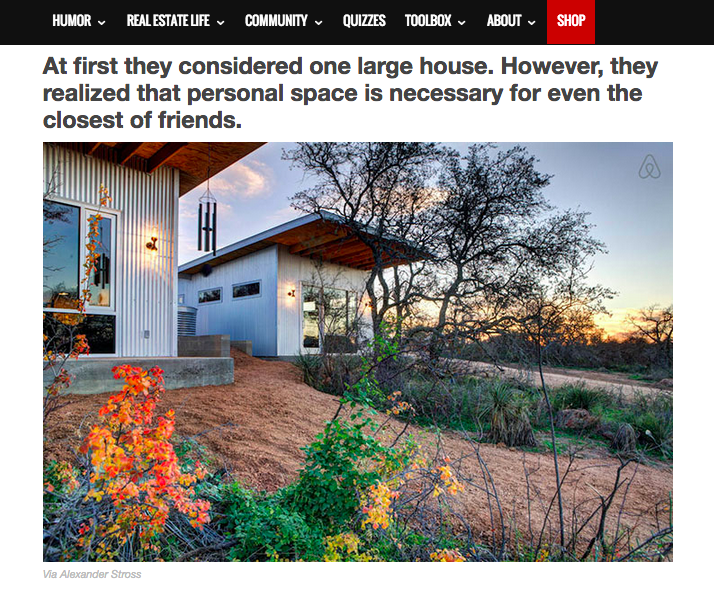 We’re fascinated by the tiny house phenomenon, especially to the extent that tiny houses might be combined with an intentional community. But that’s a more complicated undertaking than we’ve had time to figure out. It might be an option for down the road a bit. 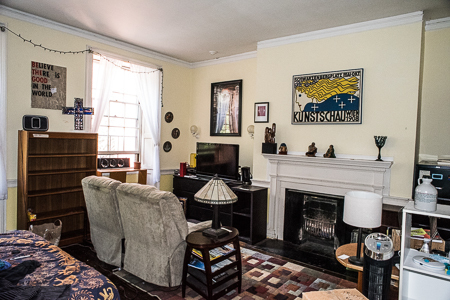 Just before moving to Boston in 2013, we were about to make an offer on this cohousing unit in the city’s Jamaica Plain neighborhood. We’re still interested in cohousing, which offers a more moderate version of our current life in a room. In cohousing, the accommodations for each household include all the traditional basics — including your own kitchen and bathroom. Community life is encouraged by shared use of a common area that typically includes a big kitchen and dining room/family room. It’s an increasingly popular lifestyle, and nothing has come on the market at JP Cohousing since the unit linked above was sold two years ago. There’s a nice place for sale at Mosaic Commons Cohousing, a facility that includes this cool common house. But it’s an hour out of Boston, and that’s too far from one of the big attractions of living here: Our daughter, Kate, and her family. With the arrival of baby Mateo on March 29, Kate and family have outgrown their third-floor walk-up near Cleveland Circle in Brookline. Ideally, Carol and I will find a place close enough to their new location to enable use of a url I lined up with these next steps in mind: acrossthehall.org. Attend all workdays and retreats. Have an awareness of inclusive behavior. What’s expected in terms of commitment to the house? Indicate by words/actions that BHFH and the Quaker values it upholds are a priority. The process also includes meeting with a “clearness committee” made up of several housemates. In the best Quaker tradition, the idea is to invite trusted friends to help us think through what the past two years have been like and what might best lie ahead. In some ways, I found the process more complicating than clarifying. As much as I look forward to what’s next — living even closer to one of our grown children and her family — I’m reluctant to leave a community I love. But that’s the idea of a clearness committee — getting in touch with what really matters and the tough choices ahead. Stay tuned. What’s next for your living arrangement? Staying put or trying something new? We hope you’ll chime in — along with a possible url! — in the comments below. This entry was posted in Community, Family and tagged Posted by Bill Mitchell. Bookmark the permalink. Bill: Suzanne and I are considering (down the road) doing the RV-living-on-the-road thing, but with a not-behemoth vehicle. Are you aware of what Mike Wendland has been doing? He and his wife kept their Michigan house, but spend much/most of the year on the road in a “class B” Roadtrek RV. He blogs, podcasts, and shoots video for Roadtrek. http://roadtreking.com/about/ Sounds like a great retirement lifestyle, and like your situation, they meet lots of interesting new people. I have followed Mike’s RV travel, Steve. It looks like a lot of fun. We’re thinking about a mix of several options — including various dimensions of the sharing economy. Good luck to you and Suzanne! I’ve always fantasized about a commune of friends in our old age. It’s only a fantasy. There’s nothing in northern Michigan that’s already organized. I suppose 6 or 8 of us could find an old house and make it work. Funny, when I was newly with Larry (35 years ago!) all I wanted was privacy for the two of us Now, I want friends around us. Us, too, Susan. Turns out we behave much better (and have more fun) with friends around! The trouble is…. not all our friends like each other as much as we like them all.